Algiers will perform at Babylon tonight. Babylon, one of Istanbul's hippest venues, continues to host representatives of different styles and cultures. This week it will welcome, U.S. band Algiers and Kabus Kerim, a cult figure of the hip-hop music scene. It will also celebrate Bob Marley's 74th birthday. Algiers will perform at Babylon tonight. But the evening's program will open with a performance by Jakuzi, one of the most-loved bands in Turkey's independent music scene. 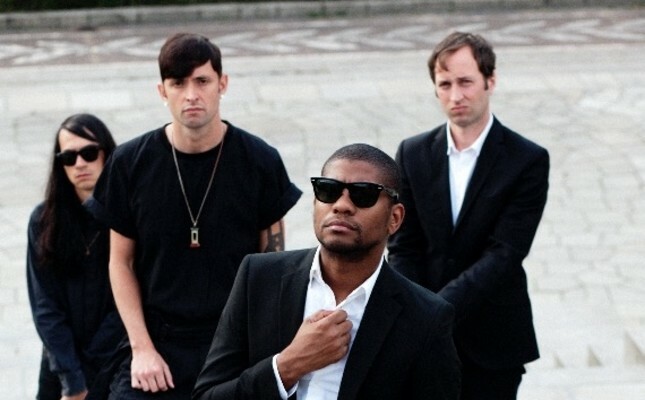 Using a blend of different styles, like gospel, noise and post-punk, Algiers released their debut album in 2015. The members of the band were all born and raised in Atlanta, U.S., where they observed racist and institutional violence first hand, before being pushed together to make music. Algiers wants to give hope to people with their eclectic, positive and soul beats along with their activist aspect. Produced by Adrian Utley, the group released their album "The Underside of Power" in 2017. Founded by Kutay Soyocak and Taner Yücel in 2015, Jakuzi entered the independent music scene with their "Koca Bir Saçmalık" (Huge Nonsense). It drew a lot of attention with their synth-pop, darkwave and new-wave music. The band released their first album "Fantezi Müzik" (Fantasy Music) in cassettes, under the label of Domuz Records. The album was released again, with the addition of four more songs, in CD and digital forms under the label of City Slang Records, a Berlin-based record company. Performing in different cities around Europe, including Paris, London, Berlin and Amsterdam, Jakuzi features Kutay Soyocak on the vocal, Can Kalyoncu on the drums, Meriç Erseçgen on the bass, Ahmetcan Gökçeer on the guitar and synths. The band is currently working on their second studio album. Their last concert before this new album will be at Babylon. Kabus Kerim, from bands Cartel and Karakan, has a cult following in the Turkish hip-hop scene. He will take the booth at Babylon tomorrow, as part of the Ethnic Bass series. Sounds that combine traditional music of different geographies with bass-based substructures, electronic beats, dub, trap, hip-hop, funk and rock elements will be carried to Babylon's dance floor within this series. A number of musicians, who have garnered huge fan followings thanks to their musical styles rooted in the British and Jamaican sound system culture, street and different languages along with their protest stand, will also perform at the venue. Sustaining the old hip-hop culture with the principle of "from old to new, always forward," Kabus Kerim, one of the former members of Cartel and Karakan bands, will perform from his Turkish funk and psychedelic selection. Like every year, Babylon will celebrate the 74th birthday of Bob Marley on Saturday, Feb. 9, with a special program featuring some of his biggest hits.